Listen. If you think this letter writing business is going to be strictly a one way matter you had better try another blasted think. Here am I, pouring my bruised soul out in an effort to collect a bit of sympathy and all I get is a sneer from the postman. I won’t do my friend – it definitely will not do. While admitting that you have a load of roughs around you, I still like to maintain my contacts with the underdog and any news of them is welcome. I hope the fact of my incarceration upon the island has not caused you to celebrate in such a wild manner that you have been apprehended and stuck in the jug. At least I don’t mind if you are in jail but you might try and kid one of the others to reply to my literary efforts. Your cribbage board has crumbled from dry rot through lack of use and in any case my side had been filled for weeks. Moloney, to drink. Personally, having the greatest respect for my linings, I am a staunch tee-totaller. This will doubtless cause Mr. Hunt to whimper with delight but – I can assure him that it is purely a safety precaution and does not mean I have joined his mob. In fact, when I get the chance, I shall have much pleasure in being sick on his carpet. The little job we came over to do seems to be stretching out longer than was anticipated. This is nothing new in my young life and therefore I can view the future with a calm mind. I shall very likely die of senile decay round here somewhere. The one snag is, I shall have to make fresh contacts when I get back to the mainland and that means you sometimes buy beer and she still insists on walking all the evening. Not that I dont[sic] trust the boys back there but, I wouldn’t let a dog run loose where they are, much less my black browed beauty. I must consider myself, I am afraid, a deserted man. The lack of news from your end of course, debars me from having anything to write about the rest of the mob in the den of thieves. At one time, I understand, Mr. W. Collins, was about to break out into a rash letter. Not having received one, I suppose the correspondence school gave up the idea of ever teaching him to write. If any other loafer should feel like writing to me, tell him to keep it secret and surprise me. After the last fortnight I’d be suprised [sic] if I got a letter from the income tax people. Moving to less pleasant subjects, how is brother George these days? Still driving the Turks out of Salonika or planning the recapture of Singapore? Now the finer weather is here he can talk without fear of getting his hands frostbitten. And Rusty. I suppose he still explodes according to plan. Three times a week? As long as he can still keep a firm hand on the old roue [sic]– Mr. Evans – things will be all right but – if what I hear is right and my own eyes are witness – once he lets Dave off the chain – the chapel money will be frittered away in wine, women and song. And that would be terrible, especially the song part. Seeing that Russia is doing so well, I suppose my two friends, Cocky Warren and Arthur Gilbert, are now comissars [sic] for the chapel. Who has got their places in the minders lounge now? I shall – I hope – at some not too distant date, be [deleted] ing [/deleted] getting my leave. The fact that I missed it last time has by now penetrated into what goes for a mind with you. That you were very disappointed I can quite imagine. I have a wonderful imagination. In fact I should think the cheering has only just died down. However, when they turn me loose from here, I shall stuff in a pass and make tracks for the big city. Keep the striped awning – red carpet and bunting handy and get a crate in ready. Book my seat in a corner near the bar and I’ll let you know if I get a ticket. afraid I must finish off as the war is awaiting my urgent attention. Give my regards to the OPA’s, engineers etc. Kiss jack Denny for me. Remember me to all at home. That is if you dare go home. And dont [sic] forget to write. Remember me to Fred. Cooper. 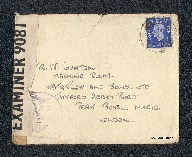 Peter Lamprey, “Letter from Peter Lamprey to W Gunton,” IBCC Digital Archive, accessed April 24, 2019, https://ibccdigitalarchive.lincoln.ac.uk/omeka/collections/document/6629.